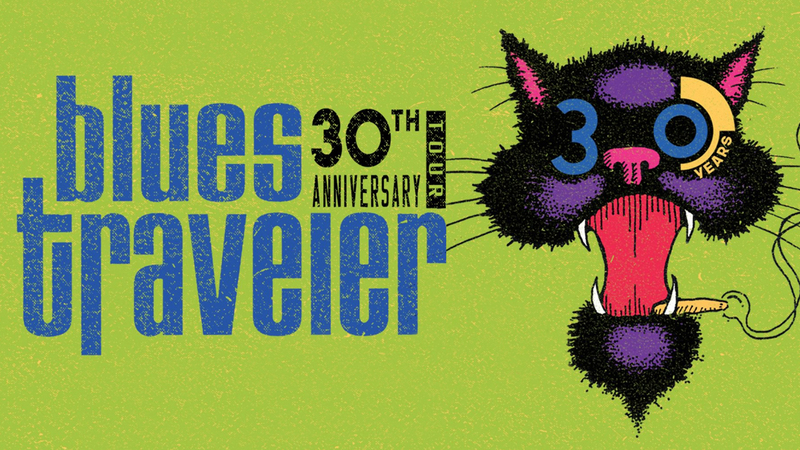 Like Phish and Widespread Panic, Blues Traveler emerged in the early 1990s as part of a new vanguard of jam bands in the tradition of the Grateful Dead and the Allman Brothers. Early on, the band’s reputation was built on relentless touring, marathon sets, and the explosive harmonica solos of oversized frontman John Popper. It all began in Princeton, New Jersey, where the Cleveland-born Popper formed the Blues Band with fellow high school students Brendan Hill, Bobby Sheehan, and Chan Kinchla. After graduation, the quartet moved to New York City, where they adopted the name Blues Traveler and became fixtures on the area club circuit. Famed concert promoter Bill Graham agreed to manage the quartet and helped them secure a contract with A&M in 1989. Relentless touring helped push the band’s self-titled debut album to #136 in early 1991. Travelers & Thieves, released later that year, and featuring a guest turn by Gregg Allman on the epic jam “Mountain Cry,” went to #125. In 1992, Popper founded the H.O.R.D.E. (Horizons of Rock Developing Everywhere) festival as a means to unite with like-minded, jam-oriented bands for outdoor summer shows. The H.O.R.D.E. fest would soon rival the alternative Lollapalooza festival, attracting an eclectic array of performers ranging from Beck to Neil Young. The group’s fourth studio album, four, forced Blues Traveler into the mainstream, thanks to hits like Run-Around,” which reached #8 on the Billboard charts and “Hook,” which soared to #23. Those hits helped push sales for four over the 6-million mark. “Run-Around” also earned the band a Grammy in 1995 for Best Rock Performance by a Duo or Group with Vocal. Popper and the band were dealt a heavy blow, when Bobby Sheehan died of an accidental drug overdose that August. In the midst of their mourning, the remaining band members decided to carry on, with Chan Kinchla’s younger brother Tad coming on board to play bass and a fifth member, Ben Wilson, joining on keyboards.